Pulmonary embolism is a fairly common condition that can be fatal. According to the American Heart Association, an estimated 600,000 Americans develop pulmonary embolism annually; 60,000 die from it. As many as 25,000 Americans are hospitalized each year for pulmonary embolism, which is a relatively common complication in hospitalized patients. Even without warning symptoms, pulmonary embolism can cause sudden death. Treatment is not always successful. Pulmonary embolism is difficult to diagnose. Less than 10% of patients who die from pulmonary embolism were diagnosed with the condition. It occurs when emboli block a pulmonary artery, usually due to a blood clot that breaks off from a large vein and travels to the lungs. More than 90% of cases of pulmonary embolism are complications of deep vein thrombosis, blood clots from the leg or pelvic veins. Emboli can also be comprised of fat, air, or tumor tissue. When emboli block the main pulmonary artery, pulmonary embolism can quickly become fatal. 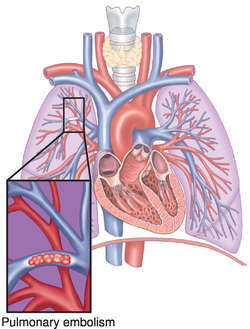 Pulmonary embolism is caused by emboli that travel through the blood stream to the lungs and block a pulmonary artery. When this occurs, circulation and oxygenation of blood is compromised. The emboli are usually formed from blood clots but are occasionally comprised of air, fat, or tumor tissue. Risk factors include: prolonged bed rest, surgery, childbirth, heart attack, stroke, congestive heart failure, cancer, obesity, a broken hip or leg, oral contraceptives, sickle cell anemia, congenital coagulation disorders, chest trauma, certain congenital heart defects, and old age. labored breathing, sometimes accompanied by chest pain. a cough that produces bloody sputum. fluid build-up in the lungs. In some cases there are no symptoms. Pulmonary embolism can be diagnosed through the patient's history, a physical exam, and diagnostic tests including chest x ray, lung scan, pulmonary angiography, electrocardiography, arterial blood gas measurements, and leg vein ultrasonography or venography. A chest x ray can be normal or show fluid or other signs and rule out other diseases. The lung scan shows poor flow of blood in areas beyond blocked arteries. The patient inhales a small amount of radiopharmaceutical and pictures of airflow into the lungs are taken with a gamma camera. Then a different radiopharmaceutical is injected into an arm vein and lung blood flow is scanned. A normal result essentially rules out pulmonary embolism. A lung scan can be performed in a hospital or an outpatient facility and takes about 45 minutes. Pulmonary angiography is the most reliable test for diagnosing pulmonary embolism but it is not used often, because it carries some risk and is expensive, invasive, and not readily available in many hospitals. Pulmonary angiography is a radiographic test which involves injection of a pharmaceutical "contrast agent" to show up the pulmonary arteries. A cinematic camera records the blood flow through the lungs of the patient, who lies on a table. Pulmonary angiography is usually performed in a hospital's radiology department and takes 30 minutes to one hour. An electrocardiograph shows the heart's electrical activity and helps distinguish pulmonary embolism from a heart attack. Electrodes covered with conducting jelly are placed on the patient's chest, arms, and legs. Impulses of the heart's activity are traced on paper. The test takes about 10 minutes and can be performed in a physician's office or hospital lab. Arterial blood gas measurements can be helpful, but they are rarely diagnostic for pulmonary embolism. Blood is taken from an artery instead of a vein, usually in the wrist and it is analyzed for oxygen, carbon dioxide and acid levels. Venography is used to look for the most likely source of pulmonary embolism, deep vein thrombosis. It is very accurate, but it is not used often, because it is painful, expensive, exposes the patient to a fairly high dose of radiation, and can cause complications. Venography identifies the location, extent, and degree of attachment of the blood clots and enables the condition of the deep leg veins to be assessed. A contrast solution is injected into a foot vein through a catheter. The physician observes the movement of the solution through the vein with a fluoroscope while a series of x rays are taken. Venography takes between 30-45 minutes and can be done in a physician's office, a laboratory, or a hospital. Radionuclide venography, in which a radioactive isotope is injected, is occasionally used, especially if a patient has had reactions to contrast solutions. Most commonly performed are ultrasound and Doppler studies of leg veins. Patients with pulmonary embolism are hospitalized and generally treated with clot-dissolving and clot-preventing drugs. Oxygen therapy is often needed to maintain normal oxygen concentrations. For people who can't take anticoagulants and in some other cases, surgery may be needed to insert a device that filters blood returning to the heart and lungs. The goal of treatment is to maintain the patient's cardiovascular and respiratory functions while the blockage resolves, which takes 10-14 days, and to prevent the formation of other emboli. Thrombolytic therapy to dissolve blood clots is the aggressive treatment for very severe pulmonary embolism. Streptokinase, urokinase, and recombinant tissue plasminogen activator (TPA) are thrombolytic agents. Heparin is the injectable anticoagulant (clotpreventing) drug of choice for preventing formation of blood clots. Warfarin, an oral anticoagulant, is usually continued when the patient leaves the hospital and doesn't need heparin any longer. Deep vein thrombosis — A blood clot in the calf's deep vein. This frequently leads to pulmonary embolism if untreated. Emboli — Clots or other substances that travel through the blood stream and get stuck in an artery, blocking circulation. Thrombosis — The development of a blood clot inside a blood vessel. About 10% of patients with pulmonary embolism die suddenly within the first hour of onset of the condition. The outcome for all other patients is generally good; only 3% of patients who are properly diagnosed and treated die. In cases of undiagnosed pulmonary embolism, about 30% of patients die. Pulmonary embolism risk can be reduced in certain patients through judicious use of antithrombotic drugs such as heparin, venous interruption, gradient elastic stockings and/or intermittent pneumatic compression of the legs. American Heart Association. 7320 Greenville Ave. Dallas, TX 75231. (214) 373-6300 or (800) 242-8721. inquire@heart.org http://www.americanheart.org. the sudden blocking of an artery by a clot of foreign material (embolus) that has been brought to its site of lodgment by the blood current. The obstructing material is most often a blood clot, but it may be a fat globule, air bubble, piece of tissue, or clump of bacteria. Symptoms. The symptoms of an embolism usually do not appear until the embolus lodges within a blood vessel and suddenly obstructs the blood flow; this usually occurs at divisions of an artery, where the vessel narrows. The signs of obstruction appear almost immediately with severe pain at the site. If the embolus lodges in a limb, the area becomes pale, numb, and cold to the touch, and normal arterial pulse below the site is absent. Fainting, nausea, vomiting, and eventually severe shock may occur if a large vessel is occluded. Unless the obstruction is relieved, gangrene of the adjacent tissues served by the affected vessel develops. Prevention. Venous thrombosis is the most common predisposing cause of embolism, particularly when a thrombus lodges in a limb. In order to prevent the development of emboli it is necessary to avoid venous stasis in patients confined to bed because of surgery, illness, or injury. In addition to physical inactivity, heart failure and pressure on the veins of the legs and pelvis can inhibit blood flow and thus set the stage for inflammation, clot formation, and the possibility of embolism. Although frequent changing of position, exercise, and early ambulation are necessary to the prevention of thrombosis and embolism, sudden and extreme movements should be avoided. Under no circumstances should the legs be massaged to relieve “muscle cramps,” especially when the pain is located in the calf and the patient has not been up and about; pain in the calf may be symptomatic of a thrombosis. The occurrence of an air embolism can be avoided by careful handling of equipment used for intravenous therapy, correct technique in administering intramuscular injections, and intra-arterial monitoring. cerebral embolism embolism of a cerebral artery, one of the three main causes of stroke syndrome. pulmonary embolism (PE) obstruction of the pulmonary artery or one of its branches by an embolus. The embolus usually is a blood clot swept into circulation from a large peripheral vein, particularly a vein in the leg or pelvis. Factors that predispose a patient to this condition include: (1) stasis of blood flow, as in a patient who is on prolonged bed rest, is immobilized for some reason, or is aged, obese, or suffering from a burn; (2) venous injury, as from surgical procedures or trauma and fractures of the legs or pelvis; (3) predisposition to clot formation because of malignancy or use of oral contraceptives; (4) cardiovascular disease; (5) chronic lung disease; and (6) diabetes mellitus. The effects of pulmonary embolism will depend on the size of the embolus and the amount of lung tissue involved. When an embolus becomes lodged in a pulmonary blood vessel, it prevents adequate blood supply to the lung, interferes with the exchange of oxygen and carbon dioxide, and results in arterial hypoxemia. As pressure within the obstructed pulmonary artery increases there is strain on the right ventricle and it may eventually fail. Two other complications are pulmonary infarct and pulmonary hemorrhage. Signs and symptoms of pulmonary embolism vary greatly, depending on the extent to which the lung is involved, the size of the clot, and the general condition of the patient. Simple, uncomplicated embolism produces such cardiopulmonary symptoms as dyspnea, tachypnea, persistent cough, pleuritic pain, and hemoptysis. Apprehension is a common symptom. On rare occasions the cardiopulmonary symptoms may be acute, occurring suddenly and quickly producing cyanosis and shock. Fibrinolytic therapy should be initiated as soon as possible for patients with massive or unstable pulmonary embolism. heparin will not dissolve existing clots but is a drug often used in treatment of the condition; it prolongs clotting time and allows the body time to resolve the existing clot. The drug most often used in the treatment of PE is heparin, which prolongs clotting time and allows the body time to resolve the existing clot. Preventive measures include passive or active dorsiflexion of each foot at least ten times each hour; turning, coughing, and deep breathing after surgery; early ambulation whenever possible; and avoidance of pressure, such as propping pillows under the knees or bending the bed at the knees, that could produce venous stasis. Since patients receiving continuous intravenous therapy also are at risk for formation of clots and emboli, intravenous sites should be changed at frequent intervals. Detection of pulmonary embolism in its earlier and more treatable stages demands constant vigilance for signs that a clot is forming or an embolus is in the blood stream. The more common signs of simple, uncomplicated embolism are listed above. Additionally, the patient is watched for increased jugular pressure, elevated pulse and heart rate, and friction rub. Eliciting Homans' sign (discomfort behind the knee on forced dorsiflexion of the foot), noting skin and temperature changes in the area of the calf, and assessing edema of the extremities are important monitoring activities in the care of patients at risk for pulmonary embolism. embolism of pulmonary arteries, most frequently by detached fragments of thrombus from a leg or pelvic vein, commonly when thrombosis has followed an operation or confinement to bed. the blockage of a pulmonary artery by fat, air, tumor tissue, or a thrombus that usually arises from a peripheral vein (most frequently one of the deep veins of the legs). Predisposing factors include an alteration of blood constituents with increased coagulation, damage to blood vessel walls, and stagnation or immobilization, especially when associated with pregnancy and childbirth, congestive heart failure, polycythemia, or surgery. Pulmonary embolism is difficult to distinguish from myocardial infarction and pneumonia. It is characterized by dyspnea, anxiety, sudden chest pain, shock, and cyanosis. Pulmonary infarction, which often occurs within 24 hours after the formation of a pulmonary embolus, is further characterized by pleural effusion, hemoptysis, leukocytosis, fever, tachycardia, atrial arrhythmias, and striking distension of the neck veins. Analysis of blood gases reveals arterial hypoxia and hypocapnia. 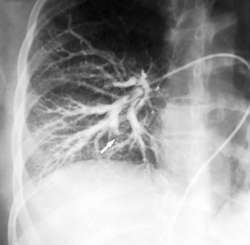 Pulmonary embolism is detected by chest radiographic films, pulmonary angiography, and radioscanning of the lung fields. Two thirds of patients with a massive pulmonary embolus die within 2 hours. Initial resuscitative measures include external cardiac massage, oxygen, vasopressor drugs, embolectomy, and correction of acidosis. The formation of further emboli is prevented by the use of anticoagulants, sometimes the use of streptokinase or urokinase, and also surgical intervention. Ambulation, exercise, and use of sequential compression devices on the lower extremities also are recommended for prevention. A vena cava filter may be inserted if pulmonary emboli recur. The migration of an embolus of material, often a blood clot, from elsewhere in circulation that lodges in the pulmonary arteries, occluding same and causing pulmonary infarction, right heart failure and decreased oxygenation. Most (95%) pulmonary emboli (Pes) originate in the deep (popliteal, femoral, iliac) leg veins. Pes cause about 4% of all US hospital deaths/year and are largely preventable. Dyspnoea, chest pain, tachycardia, tachypnoea, low-grade fever, ± haemoptysis, syncope, ± signs of DVT (e.g., right ventricular heave, right-sided S3, rales). PE is underdiagnosed as the classic signs of dyspnoea (seen in 59%), chest pain (17%) and haemoptysis (3%) are absent, or the patient may be unable to communicate as he or she is comatose or sedated. ▪ CXR—Usually normal; rarely, Hampton sign (wedge shaped infarct) or Westermark sign (reduced blood in embolic lung zone). ▪ Pulmonary angiogram—Accurate, but a high-risk procedure. ▪ Ultrasound—DVT may be seen. ▪ EKG—Sinus tachycardia, nonspecific ST-T wave changes (pathognomonic SI, QIII, TIII). ▪ ABG—Respiratory alkalosis (increased pH, decreased CO2 < 80 mm Hg). Blood stasis, immobilisation, CHF, surgery, trauma, venous endothelial damage, hypercoagulability (e.g., pregnancy, postpartum), oral contraceptives, protein C deficiency, protein S deficiency, factor V (Leiden mutation), malignancy, severe burns. Early post-surgical and postpartum ambulation, exercise if patient is bed-ridden, anticoagulation, inferior vena caval filters. Heparinisation; long-term anticoagulation with warfarin. dyspnea–seen in 59%, chest pain–17%, and hemoptysis–3% are absent, or the Pt may be unable to communicate as he/she is comatose or sedated Imaging–CXR Usually normal, rarely Hampton sign–wedge shaped infarct or Westermark sign–low blood in embolic lung zone; VQ scan Lung mismatch Pulmonary angiogram Accurate but a high-risk procedure in these Pts Ultrasound DVT may be seen EKG Sinus tachycardia, nonspecific ST-T wave changes–pathognomonic SI, QIII, TIII ABG Respiratory alkalosis– ↑ pH, ↓ CO2 < 80 mm Hg Risk factors Blood stasis, immobilization, CHF, surgery, trauma, venous endothelial damage, hypercoagulability–eg, pregnancy, post-partum, oral contraceptives, protein C deficiency, protein S deficiency, factor V–Leiden mutation, malignancy, severe burns Prevention Early post-surgical and postpartum ambulation, or exercise if Pt is bed-ridden, anticoagulation, inferior vena caval filters Management Heparinization; long-term anticoagulation with warfarin. In the hospitalized patient, early mobilization, administration of prophylactic anticoagulants, and compression stockings (elastic or pneumatic) may prevent deep venous thrombosis (DVT). Vital signs, oxygen saturation, respiratory effort, breath sounds, cardiac rhythm, and urinary output are monitored closely in affected patients. Signs of deterioration are promptly reported. The nurse assists with diagnostic studies and medical treatment and provides explanations of procedures and treatments, analgesics for pain, prescribed medications, supplemental oxygen, patient education, and emotional support. Once the pain is stable, the patient is encouraged to resume normal activities. After a pulmonary embolism most patients remain on anticoagulant therapy for at least 6 months. The patient is taught about taking the medication dosage precisely as prescribed, bleeding signs to be reported, avoidance of over-the-counter and prescription drugs that may influence anticoagulation, regulation of foods high in vitamins, and the need for frequent blood tests to ensure appropriate levels of anticoagulation. See: International Normalized Ratio. In patients who cannot use anticoagulants, a filtering device may be inserted transvenously into the vena cava to try to prevent blood clots from embolizing from the legs to the heart and lungs. Occlusion of a main lung artery or one of its branches by an EMBOLUS, usually a large blood clot that has been carried in the bloodstream from a deep leg or pelvic vein where it has formed as a result of PHLEBITIS. A large pulmonary embolism is usually fatal and is a much-feared complication of recent surgery or pregnancy with prolonged immobilization and inadequate movement of the limbs. Moderate-sized emboli cause chest pain, breathlessness, dizziness from low blood pressure and coughing up of blood. Repeated small emboli may cause PULMONARY FIBROSIS or PULMONARY HYPERTENSION. Treatment is with an anticoagulant drug to reduce the clotting ability of the blood and with thrombolytic drugs to help to dissolve the clots. In a massive pulmonary embolism life may sometimes be saved by an emergency operation to remove the clot. Embolism of pulmonary arteries, most frequently by detached fragments of thrombus from a leg or pelvic vein. n the blockage of a pulmonary artery by foreign matter such as fat, air, tumor tissue, or a thrombus that usually arises from a peripheral vein. It is difficult to distinguish from myocardial infarction and pneumonia. Our findings show significantly higher frequency of prothrombin gene mutation in patients with pulmonary embolism and recurrent thrombosis which might suggest increased risk associated with the mutation. In case of pulmonary embolism, echocardiography may detect right heart thrombi. In this case report, we presented a patient with a large tumor mass occupying the whole pelvis and abdomen, and with DVT, in whom IVCF was inserted for perioperative prevention of pulmonary embolism. The role of multidetector computed tomography angiography for the diagnosis of pulmonary embolism. Intracerebral hemorrhage with thrombolytic therapy for acute pulmonary embolism. Paroxysmal atrioventricular block, cause of syncope in pulmonary embolism. The final diagnosis was acute massive pulmonary embolism, moderate to severe pulmonary arterial hypertension, deep venous thrombosis of the right lower limb and thrombophilia. In recent years, the utilization of pulmonary CT angiography has increased substantially, while the yield of pulmonary embolism remains low (4,5). Results of the Prospective Investigation of Pulmonary Embolism Diagnosis (PIOPED). Recently, convex probe EBUS (CP-EBUS) has recently come to be used to diagnose central pulmonary embolism. It also reviews key players involved in the therapeutic development for Pulmonary Embolism and special features on late-stage and discontinued projects. Report Published: "Pulmonary Embolism - Pipeline Review, H2 2015"